There are concerns he made the statement under duress. 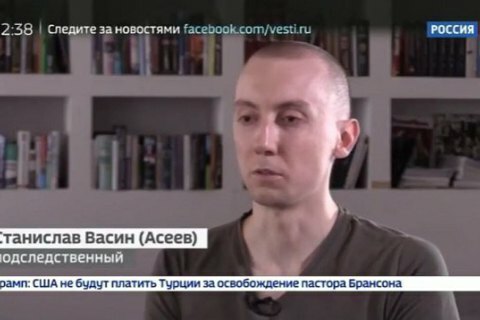 The Russian state-owned TV channel Rossiya 24 has shown Donetsk journalist Stanislav Aseyev, writing under the pen name Vasin, who has been held captive by Donetsk separatists (DPR), the Novosti Donbassa website has reported.A 14-minute feature, the channel said that he was detained on suspicion of espionage. “The article under which I am charged in accordance with the DPR legislation concerns espionage. In this case, I accept the charges, I do not deny them and I can say quite openly that I have indeed worked for the Main Intelligence Directorate of Ukraine,” he is shown saying in a video interview. He was interviewed by a Rossiya 24 correspondent in the Krupska library in Donetsk. On the video, Aseyev can also be seen in a cell, being transported in a car in handcuffs. Later he was accompanied by a man wearing a black mask. Aseyev’s friend, ex-MP Yehor Firsov said that the video in prison was staged and that the journalist was forced to have this interview. “I hope no-one will take this fake seriously because it is an apparent, as I said earlier, planned staging,” he said on Facebook. The 27-year-old journalist went missing in a separatist-controlled territory on 2 June 2017. On 11 June, the Security Service of Ukraine confirmed his disappearance. On 28 July, Russia said that he was detained in occupied Donetsk Region on criminal charges. In early July 2018., Firsov said Aseyev may have announced a hunger strike.